When I first started getting into distance running I struggled to get through runs more than eight or 10 miles and after 13 mile runs I was tired and essentially useless for the rest of the day. After lamenting over this to a running mentor, I got my first insight into proper fuel and wrote about fueling up for long runs. Like so many things in running, figuring out the proper fuel, involves a bit of trial and error as well as practice. Three years later I’m still trying to figure out the best fuel formula for me. Though I now have much greater knowledge of what it means to properly fuel up and I understand the benefits of fueling up, I am still learning about the options and what combinations of the many options available work best for me. I started by adding a fuel belt to long runs and depending on the length of the run would fill just two or all four bottles with water. 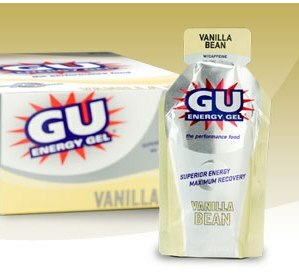 For runs longer than 10 miles I would add a Gu packet or two in Vanilla Bean flavor. That’s it. And on those long runs I know where every possible bathroom stop is located. I like Gu because it is easy to carry–fits in most small pockets on tops or pants/shorts (or in a Gracie’s Gear sports bra), is very easy to consume while running, and I actually happen to like the Vanilla Bean flavor. But Gu gels make me thirsty and I think the combination of water later and the sugary, liquid-like Gu gels just don’t mix well with the jostling of my stomach on long runs. One of the great things about doing races and getting to know other runners, and in my case joining the Annapolis Triathlon Club, is that you learn quickly about other options. Thanks to races I had the chance to try Clif Shot Gel which seemed to be a little easier on my stomach and has decent flavors available. I also went through a short phase of using Hammer Gels which many triathletes swear by but for me, the flavors tasted a little bitter and I am not sure they were any better on my stomach than Gu. In the last couple years, the options for energy, training, and racing fuel have come to resemble every day items you might find in your pantry and just as easily grab for a snack. From jelly beans to granola bars to candy-like chews, the options for a non-gel fuel are plentiful. While I was training for the half Ironman, bike rides got longer and longer and I quickly found that a Gu pack or two was nowhere near the right amount of calories or substance I needed to maintain my energy on a long ride. 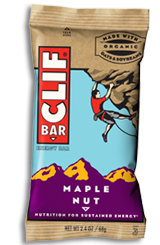 I tried a wide variety of Clif Bars until I realized that Maple Nut was the best flavor. A couple Gus and a Maple Nut Clif Bar were the ideal “meal” on 30-plus mile rides. The pockets on the back of a riding shirt are ideal for carrying larger items like a Clif Bar and while not graceful, it’s not terribly hard to eat while riding. 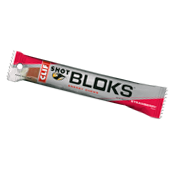 The only other “solid” fuel I’ve tried, thanks to getting them for free at a race, are the Clif Shot Bloks. I found the flavor, consistency, and energy these little chews provided was the right combination for me. However, I struggled with the packaging so terribly that on the final stretch of the half Ironman bike ride I dropped the whole package without ever getting a Blok into my mouth. On three out of three rides where I tried to use the Bloks, I dropped the whole kit and caboodle each time. I’m a water girl, plain and simple. I carry a large Nalgene with me every day to work, I have a glass of water next to my bed, I drink up at night and first thing in the morning…all day long I gulp down water. So when I need to have liquid fuel while training and racing I have water. I remember during high school volleyball we consumed a lot of Lemon-Lime Gatorade and I never really loved the sugary sports drink and I think perhaps that turned me off from “spiking” my water during recent years. But only recently have I started to learn about electrolytes. I haven’t found a mix yet that I love but Nuun tablets are ok. I don’t use them often and to be honest, I still have lots to learn about what the right liquids are, when to consume then, and what to expect from my body when I make the switch from straight water to enhanced sports drinks. I posed the question on Twitter about what fuel other athletes use and immediately got two recommendations which I will definitely check out. I plan to continue researching and will try new things until I find the right combination but I’d also love to hear what fuel works for you. Honey Stinger Waffles were one recommendation (thank you @jeffhuntley!) and in being told they come in a 2″ x 2″ size I feel hopeful they might manageable while on the run. The Honey Stinger website promotes all natural energy which is just fine for me. What I like in reading about them is that there is a high level of protein and vitamins in the products. I was also pointed to Luna Moons by @mommyvents and I know for a fact that I love Luna Bars so I was excited to learn about their mini version in chew form which should fit in a small pocket as easily as a pack of Gu. I plan to try both the Luna Moons and the Waffles. This entry was posted in Running, Triathlon and tagged biking, fuel, Gracie's Gear, Running, Training, Triathlon on January 21, 2011 by Natalie. packaging on the luna’s a bit hard as well, maybe easier while running. i usually did on bike and that was tricky. probably should just open and dump in my pockets. good luck !!! Chris, thanks for the tip. I think I have heard of Mule Bars but definitely forget about them. I’ll have to try those as well. Today Honey Stinger gel is coming on my long run. I have used CYTOMAX powder in cool citrus flavor for 3 years now. I like the control of how much I use in my “water”. Winter long runs I use 1/2 the suggested dilution and drink some before and after I run. The hotter and longer the runs, the closer I get to their recipe. However, their full ration is TOO strong for me. I also use SHOT-blocks but separate them into a self made parchment paper pouch that I stick in a pocket. That way they don’t stick to anything. Once in my mouth, I cut them in half and tuck them into my cheeks. They slowly dissolve and don’t upset my stomach at all. 1 degree here NJ, long run today will be a challenge ! Sharon, Hope your long run went well! It was much warmer here in MD…6 degrees. 🙂 16 miles was cold! I like the Shot-bloks tip. I wouldn’t have thought of the parchment paper idea, good one! Glad to have a recommendation on the Cytomax powder. I think I had a sample at a race once and didn’t love it. Same feeling about Muscle Milk but perhaps it’s time to give both another try. Natalie, glad I ran yesterday, -7 here this morning! I didn’t like the CYTOMAX fruit punch flavor that I got as a sample as well. I also have an EASY recipe for my own energy bites that I eat an hour before I run. I have trouble eating a lot of different foods but of course need to have eaten. If you can see my email address, email me & I will send it to you! I used to use the Shot Blocks on my long runs and had issues as well with the packaging and opening them. I am in the midst of training for my first 1/2 Ironman and I just recently found the Honey Stingers and they were easy to open and seem to be easier to chew than the Shot blocks. The cherry and orange are really good. These were recommended to me by a friend who absolutely swears by them. Hi Cheryl, I figured out that if I wrap 3 Shot Bloks in cellophane they easily fit in my running shirt pocket or pocket of my Fuel Belt. I tried the Honey Stinger chews and agree they were easier to manage and also good. Be warned that the Honey Stinger gel is super sugary.